Enjoy a unique experience the new home of Atlético de Madrid and visit every corner of an impressive stadium. You will have the opportunity to explore the local changing room, the tunnel whereby players leave the field and much more of the stadium. Live a unique experience as you enjoy a tour around Wanda Metropolitano Stadium. 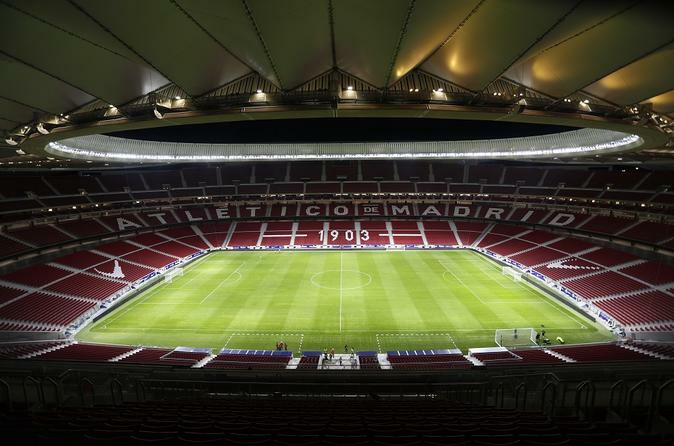 Have the opportunity to visit every corner of Atletico de Madrid's new home. Once you are in the stadium you will have the opportunity to visit the players dressing room and feel like an Atlético player yourself. Then walk down the tunnel where the players go to the field and imagine the Stadium full of 68,000 fans cheering while you walk out onto the pitch. This moment is especially exciting. In addition, also visit the mixed zone and the press room in which the players and coach appear before the media. Let yourself be equally impressed by the roof that shelters the stands and explores a sustainable stadium in which an incomparable atmosphere is lived. Your tour will continue outside the stadium which is equally as fascinating. Here you will be able to see the massive flag that honors the fans of Atletico de Madrid. Then visit the Walk of Legends of Atlético de Madrid, in which all those who have played at least 100 official matches are honored. Your tour will end at the Atletico de Madrid store where you can pick up a souvenir from this unique experience. Guided tours: Monday-Thursday at 12.00 pm, 1.00 pm, 4.30 pm and 5.30 pm. Friday at 12.00 pm and 1.00 pm. Non-guided tours: Friday: 3.00 pm, 8 p.m. Saturday: 11.00 am, 8.00 pm. Sunday and holidays: 11.00 am and 7.00 pm.